Numerous types of foods have been associated with food poisoning and a lot of cases have been linked to heat treated foods. Bacillus cereus group is involved in many outbreaks due to the consumption of cooked food. B. cereus is present in most raw foods and spores have been found also in packaging materials representing a contamination source for treated foods. Storage temperature is a critical point for processed foods in relation with spore germination. While vegetative cells die during heat treatment, spores can survive and germinate under not limiting conditions. B. cereus food poisoning is principally associated with temperature abuse during the storage of cooked foods. B. cereus may cause illness through the production of a high variety of toxins and enzymes, including a necrotizing enterotoxin, an emetic toxin, phospholipases, proteases and haemolysin inducing also non-gastro-intestinal (e.g. systemic or pulmonary) infections. Enterotoxins could also be produced from B. circulans, B. lentus and B. mycoides, B. thuringiensis and B. anthracis closely related to B. cereus. 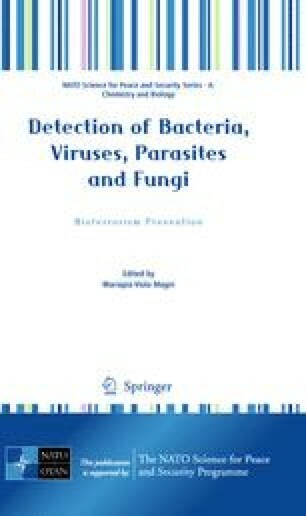 Many cases are confused with those caused by other pathogens. An accurate evaluation of potentially contaminated foods lead to the utilization of fast and sensitive methods in food monitoring to satisfy safety requirements. Classical methods which use enrichment methods due to the usual small number of B. cereus present in food, are time consuming. Moreover, recent data showed proteases and chitinases contribute to virulence leading to the need for suitable means of differentiating members of the B. cereus group during the monitoring of potentially contaminated foods. Some authors experienced difficulties distinguishing strains considered to be members of the “B. cereus group” such as B. mycoides, B. thuringiensis and B. anthracis either using classical or molecular methods. Identification by classical microbiological methods fails due to horizontal gene transfer from B. cereus group members. Characters responsible for some phenotypic characteristics can be lost from one species and can be acquired from another one causing confusion in taxonomy based upon phenotypic characters evaluation. Different molecular approaches were able to differentiate B. anthracis from B. cereus but failed to differentiate. B. cereus from B. thuringiensis. Even with recent improvements in the molecular methods used for microbial phylogeny, B. cereus, B. mycoides and B. thuringiensis were referred to as B. cereus when 16S rRNA sequences were used for the differentiation. Genetic similarity between B. cereus, B. thuringiensis and B. anthracis has been investigated by means of DNA-DNA reassociation, multilocus enzyme electrophoresis (MEE) which compare the allozyme patterns of 10–20 genes, Pulsed Field Gel Electrophoresis (PFGE), Randomly Amplified Polymorphic DNA (RAPD)-PCR, repetitive extragenic palindromic (rep)-PCR, Real Time PCR, Microarrays. Genotypic approaches tend to be less dependent on bacterial growth variables, less time consuming and useful for determining phylogenetic reltionships between microbial isolates and for assigning strains in specific groups. Molecular methods using PCR are useful in specific detection of B. cereus from plate isolates and for PCR application on microbial DNA extracted from food. Species identification can be achieved by specific couple of primers annealing gyrB gene sequence. To decrease the detection limit of B. cereus in food the type of treatment applied before DNA extraction is fundamental, as it allows the increase of the amplification reaction efficiency. Detection limit for artificially contaminated foods was 50 cells g−1 for boiled rice, 5 × 102 cells g−1 for minced meat, 30 cells g−1 for salad, 20 cells mL−1 for pasteurized milk and <10 cells mL−1 for concentrated coffee. RE technique applied onto amplification products allowed differentiation between B. cereus and B. thuringiensis for the 81 sample tested using Hinf I endonuclease. RAPD-PCR and rep-PCR used for microbial typing gave different results. Cluster analyes for rep-PCR was more effective in discriminating between B. cereus and B. thuringiensis strains than RAPD-PCR. Strains were grouped in 14 clusters, from A to P using 70% similarity by RAPD-PCR, and in ten clusters from A to L by rep-PCR using 80% similarity in fingerprinting analysis. PCR-TTGE and PCR-DGGE are methods used for single point mutations detection among DNA sequences. Amplicons obtained for B. cereus and B. thuringiensis strains were analyzed by this molecular technique to differentiate strains among the two species identified previously by the PCR-RE method. B. cereus strains were divided in seven levels whereas B. thuringiensis strains in two levels. The distribution of PCR products in each gel indicate high variability either within B. thuringiensis or B. cereus. No clear differentiation was obtained by TTGE between the two species considered. Horizontal gene transfer between strains of these different “species” makes it impossible to delineate discrete levels. A desirable goal is to differentiate the organisms detected in food products and patients to understand the real contribution of B. cereus and B. thuringiensis to human infections, either due to food consumption or to hospitalization, using fast and sensitive protocols.